One of the best commercial whitewater rafting rivers in the world, the Pacuare River runs down from the Talamanca Mountains to the Caribbean coast and our Puerto Viejo Whitewater rafting tours will take you there! Our one day White Water Rafting Pacuare River Class III/IV is the best way to get to know Costa Rica's top tourist attraction, river rafting. Even better, the Pacuare River Rafting trip is also a smart connection which means you can continue on to either Arenal or San Jose after the tour....how awesome is that?!! If you have tried river rafting before or if it has been on your bucket list of things to do in Costa Rica, we offer multi-day rafting excursions from Puerto Viejo sure to exceed your expectations. Our overnight rafting excursions take you rafting the Pacuare River by day and to sleep under the stars riverside by night...an incredible and unique experience in Costa Rica. You can even add a trip to Tortuguero to your overnight rafting tour for a true Caribbean adventure. Take a look at our selection of Puerto Viejo rafting tours and multi-day rafting excursions below. The river is waiting and the choice is yours!!! 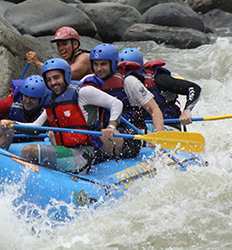 If you are looking for the best tours in Costa Rica, white water rafting the Pacuare River is ranked number one on many of the trusted traveler review sites. We invite you to come see for yourself why rafting the Pacuare River is one of the top things to do in Costa Rica. 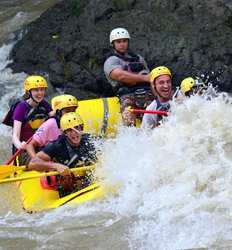 White Water Rafting Pacuare River Class III/IV deposit is $20.00 per person. Hands down, the best way to travel through Costa Rica is the Pacuare Paddle & Hike 2 Day Expedition! This river rafting adventure is perfect for those thrill seekers who are looking to test their paddling and hiking skills on the premiere whitewater rafting river of Costa Rica. Make the best of your vacation in Costa Rica and travel smart. 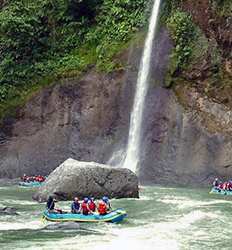 }Rafting Pacuare Class III/IV Overnight Rainforest Excursion deposit is $25.00 per person.